Discussion in 'Mac Pro' started by RedFlyer, Feb 25, 2015. I ordered a new video card for my 3,1 Mac Pro and accidentally ordered the ver that doesn't say 'For Mac Pro' not realizing that there was any difference. It seems that the video card should work, if I could get it in my tower! The difference between the two ver seems to be the length and shape of its support arm(can't figure out what to call this part), the FOR Mac Pro ver is an inch or so shorter than the other one. I saw someone suggest cutting it off with a hacksaw, which I'd really rather not do. So I was wondering if anyone has tried removing the arm/case part? It seems like it might work, but I'm concerned about it exposing any important parts, it is covered with the important legal stickers. Or does anyone have ideas short of the hacksaw plan to get this bad boy to fit in the darn machine? Use a small screwdriver to remove it, then grip it at break point in a vise. Apply force right to that point and snap it. It is made of cheap pot metal and can be broken easily. If it doesn't break where you want, live without but put screws back either way. 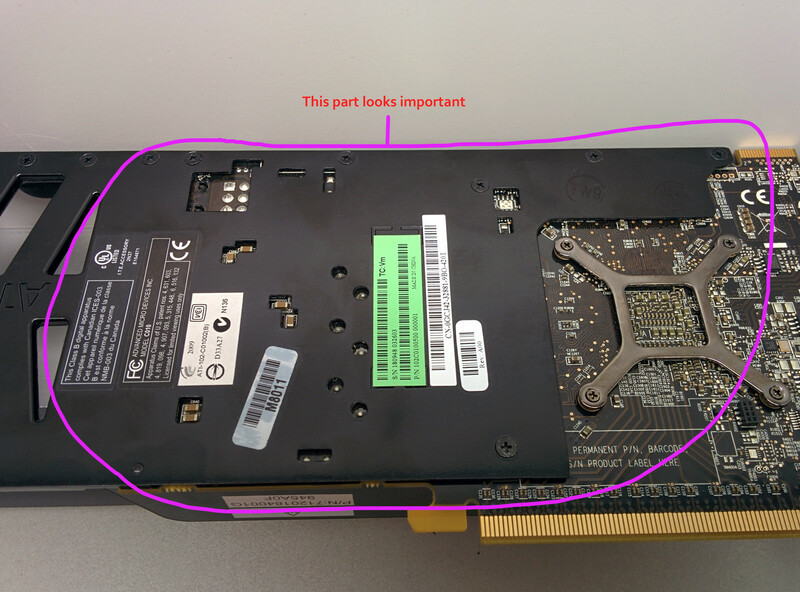 I bought a Radeon HD6870 card with a similar extended support plate a few years back, and I just removed it and put screws back as MVC suggested. 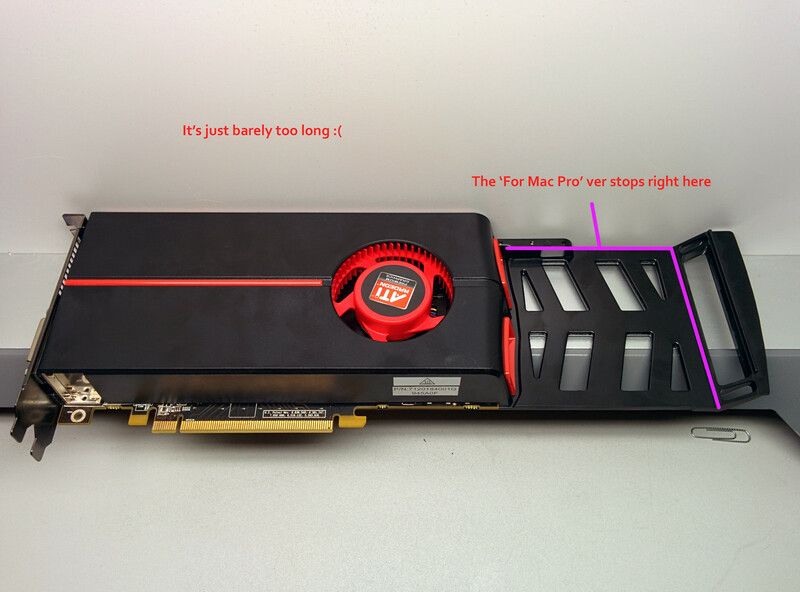 Yes, it does look ugly with an extended metal stick exposed, but has no effect on the performance of the card at all. It's just a piece of cheap metal probably used for support inside Dell's computer, if I remember correctly. 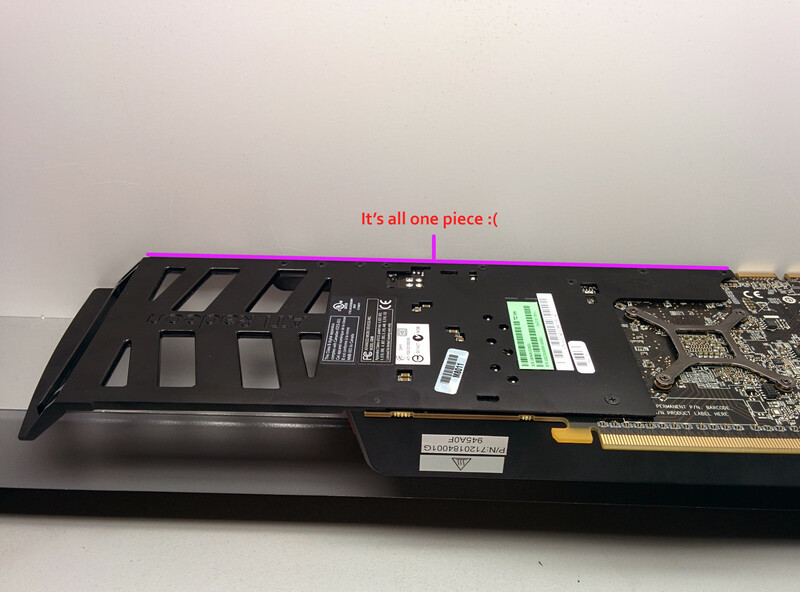 I bought a Radeon HD6870 card with a similar extended support plate a few years back, and I just removed it. Yes, it does look ugly with an extended metal stick exposed, but has no effect on the performance of the card at all. It's just a piece of cheap metal probably used for support inside Dell's computer, if I remember correctly. I have the 6870 version, too, and did exactly the same thing. The little arm at the top sticks out a bit, but it fits in the mac pro and once it's in, you can't really see it anyways! Remove the back cover. It doesn't affect anything other than the fact now the entire PCB is exposed. Again, no big deal since the card will probably be in slot 1 and there is nothing on the back side of the card that will touch it. Speaking of which, my 6870 looks just like this one, but is a Dell OEM and therefore non-EFI. Anyone know of a EFI ROM I can use to flash this card so I get the startup screen?